Thanks to everybody who came on the Christmas Social Ride today! 11 of us met at The Emporium in Piper Street, Kyneton at 8am, where the weather was already hot! 8 of us completed the more challenging 48k loop, while the other 3 completed the shorter but still challenging (especially the climb up to Springhill!) 29k loop. We all met back at The Emporium for a well earned coffee and chat! 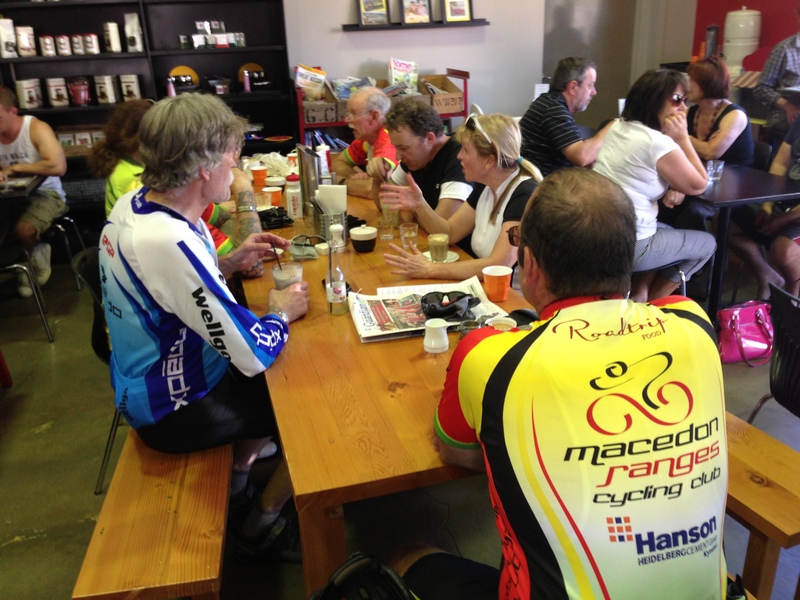 Next month’s social ride will be starting from Woodend, stay posted for more details in the New Year! UPDATE – NEW START TIME FOR SOCIAL RIDE ON SUNDAY! Because of the high temperatures forecast for the area on Sunday (in excess of 35 degrees), it has been decided to move the start time of the Social Ride on Sunday to 8:00 AM, with the pre-ride briefing at 7:50 AM. We are still starting and finishing at The Emporium Cafe, 89 Piper Street, Kyneton. Looking forward to seeing as many members as possible on Sunday! Fat Santa Christmas Social Ride! PRE BURN SOME CHRISTMAS CALORIES!